The three predominantly Muslim countries out of ten in the Association of Southeast Asian Nations (Asean), namely Malaysia, Indonesia and Brunei, are on the way to form a new hub for Islamic finance and the wider halal industry through their current roadmaps to develop the sector. Trade tensions between the U.S. and China are adding rocket fuel to the liftoff of Southeast Asia’s economies. Late this month, Asean and Chinese officials will meet in Naypyidaw, Myanmar to continue discussions on the Code of Conduct (CoC) for the South China Sea. Five countries stand out in the development of financial technologies in Southeast Asia. There have been improvements in the Southeast Asian region as a real estate destination, but Vietnam has emerged among these markets as a prime luxury destination. NO longer the stuff of technological aspiration, the Fourth Industrial Revolution is here. According to the alphabetic rules set for the annual rotation of the ASEAN chair, Thailand is to steward the grouping through 2019 in between Singapore and Vietnam. The year of 2019 is well and truly underway, but it’s not too late to make some resolutions! On 8 March 2018 in Santiago, Chile, the Comprehensive and Progressive Agreement for Trans-Pacific Partnership (CPTPP) was formally signed. Over the past few years, the ASEAN aquaculture industry has witnessed moderate growth due to land expansion, species diversification, and farming intensification. IN January I joined Federica Mogherini, the EU’s High Representative for Foreign Affairs and Security Policy, in Brussels as she co-chaired the 22nd EU-ASEAN Ministerial Meeting. Driven by a young and tech-savvy population, Southeast Asia is quickly becoming the world’s fastest growing internet market, with millions of new users coming online every month. A recent development reinforced the ongoing work to advance one of Southeast Asia’s under noticed subregional institutions. Hungary, which has had success in resolving water-management issues with its neighbours in eastern and central Europe that share the Danube River, has been asked to help Thailand work out a plan for the Mekong. The air pollution in Indonesia’s capital Jakarta is now so dire that its citizens are threatening to sue the government. PRESIDENT Rodrigo Duterte on Tuesday urged Indonesia and Malaysia to join forces with the Philippines in combating crime on the high seas, amid the continued kidnappings by Abu Sayyaf bandits. Depending on the country, the 4G download speed users experience per hour could be as much as 30 Mbps faster than the speed experienced just a few hours later, according to findings from an Opensignal report. I’ve traveled quite a bit through Southeast Asia this winter. It is evident views of China are changing — and not always for the better. Prime Minister Hun Sen on Wednesday taunted the opposition groups who wished to see him dead, saying “you have to wait until next life”, addressing in a meeting with approximately 10,000 garment workers in Kandal’s Ang Snoul district. Political veteran Kong Korm, who is currently the honorary president of the Khmer Will Party, weighed into the EBA debate on Monday, saying that withdrawing Cambodia’s trade preferences was tantamount to a Khmer saying, “getting angry with the oxen, but beating the oxen-driven cart”. Prime Minister Hun Sen yesterday met a US-based law firm and asked it to explore the possibility of providing legal services to citizens and investors in Cambodia. The United Kingdom has pledged 15 million pounds (US$19.5 million) in grants to Indonesia to accelerate the development of low-carbon energy in the country. The Indonesian government is preparing a regulation to relax the value added tax (VAT) refund requirements for foreign tourists to support efforts to achieve this year’s target to attract 20 million tourist arrivals. Hundreds of students have fled fighting in Indonesia’s restive Papua province, a local NGO said, amid unconfirmed reports of violent military reprisals after a massacre of civilian workers by separatist rebels. The Lao Ministry of Industry and Commerce this week requested China to consider a rice im-port quota of 50,000 tonnes along with accepting other industrial goods as part of efforts to bol-ster bilateral trade. In a drastic move to promote health and safety among members of Lao society, the Mayor of Vientiane has taken measures to ban the sale of alcohol or alcoholic beverages in the capital before 4pm. The National Wage Index will be a guideline to measure changes in the salaries of workers in Malaysia, said Human Resources Minister M. Kulasegaran (pic). The Malaysia Medical association (MMA) has warned the federal government today against working with groups that are stealthily being funded by tobacco companies. The Sarawak construction sector is behind on Building Information Modelling (BIM), as seen in the latest round of training in Building Information Modelling (BIM) in January. Thorough scrutiny of the projects under Beijing’s Belt and Road Initiative (BRI) is needed to assess their likely short- and long-term impacts on the country and the public, State Counselor Daw Aung San Suu Kyi said on Monday at the first meeting of a committee tasked with overseeing implementation of the projects. Myanmar’s trade value by sea from 1 October to 8 February in the current fiscal year (Oct 2018- Sep 2019) was estimated at US$8.59 billion, which is up by over $124.7 million compared to the corresponding period of last fiscal year 2017-2018, according to the data of the Ministry of Commerce. Chin State is looking to attract local and foreign investors to accelerate the development of tourism, agriculture, livestock, and electricity generation in the state, U Aung Naing Oo, the secretary of Myanmar Investment Commission (MIC), said Tuesday. The Department of Budget and Management (DBM) will push through with the cash budgeting system this year despite Congress’ scrapping of provisions on cash-based budgeting in the ratified version of the P3.757-trillion budget for 2019. The country’s external payments position strengthened for the third straight month with the balance of payments (BOP) surplus hitting a six-year high of $2.7 billion in January amid strong inflows. The country’s economic managers are requesting the Commission on Elections (Comelec) to exempt 145 key infrastructure projects from the election ban to avoid delays in the implementation of the “Build, Build, Build” program. Singapore emerged as the third largest market in Southeast Asia for Chinese tourists spending over the Chinese New Year, with an increase of 34% in average spending per Chinese tourist, according to a joint report released by Nielsen and Alipay. A haw snack has been voluntarily recalled by its supplier here after a consumer claimed that she had bitten into a piece of glass while eating it. A Yahoo poll showed that almost half (43%) of Singapore thought that the recent Budget allocations announced by Finance Secretary Heng Swee Keat were bad, only 7% thought it was good while the rest viewed it as mediocre. The Thai military has defended its spending of about 1 trillion baht, or 7% of the fiscal budget, over the past five years and claimed it had not increased substantially. IN THE face of persistent air pollution in the North, Chiang Mai University (CMU) has decided to issue warnings for locals to think twice before using the outdoor zone of its stadium. Saigon (Ho Chi Minh City) has licensed foreign investors invested 6 billion U.S. dollars into the city through mergers and acquisitions (M&A) deals in 2018, the municipal authorities said on Tuesday. The Ministry of Finance has asked the Government to amend its laws to eliminate the special consumption tax on locally manufactured auto parts and components, a move which could reduce prices of locally assembled cars. The slow listing of post-equitisation firms, including State-owned enterprises (SOEs), may make Vietnamese firms less attractive regarding a lack of corporate transparency and government agencies managing those firms must be blamed for the problem. 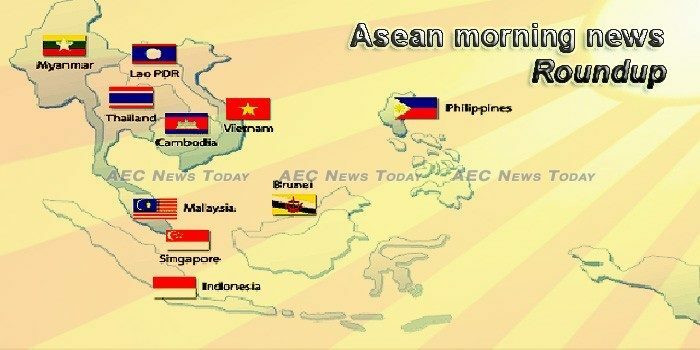 The Asean morning news roundup and its individual country morning news round-ups are the most comprehensive hand-curated selection of news reports from around the Asean Economic Community (AEC) published. We scour hundreds of local and international news and websites to find the things that you need to know to start your working week day. We clearly identify the source of the story, whether it is behind a paywall, a media release, or whether the site uses annoying pop-up advertising or auto-play video, in case those things annoy you. It’s all then packaged up in an easy to read format enabling you to make an informed choice of whether you want to learn more by clicking directly through to the original source, or keep on reading the headlines. AEC News Today: Governance, not government; policies not politics.